This black white and gold 25mm badge is a must have for any fellow Harry Potter fans. 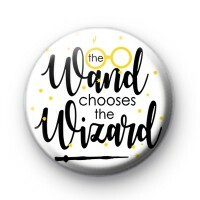 This fun badge has the quote The Wand Chooses The Wizard, written in a bold black font & an illustration of Harry's iconic round glasses and a wand. Any Potterhead will know exactly what this is quote is referring too. So if you're a massive Potter fan & have read all the books & seen all the films then I think this Potter fan badge was made for you! It is the ideal badge for any aspiring witches & wizards. Hogwarts awaits you with this wonderful Harry Potter badge. We have loads of Harry Potter and bookish themed badges so be sure to have a search or a browse through our movie badges category.